At last some fresh meat at Druridge. 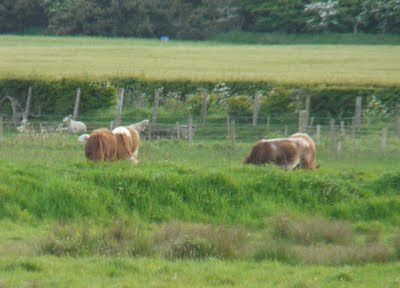 Four new cows have arrived on the Budge Fields, just in the nick of time. They have joined the ponies who haven't left for East Chev yet, so between them they should make an impact, but there's plenty to go at and they'll need to be joined by more of their friends in July. I did an evening territory mapping visit tonight, only because I am too busy to get a morning visit in. It was funny seeing red-legged partridges at High Chibburn Farm, a year tick, but already dull after the excitement of last years 'Patch ticks'. Lots of birds were carrying food, I wish I had more time to spend to watching them and do some more nest finding. Offshore a single roseate tern was year-tick, a nice close bird too. One the beach were 3 dunlin and 6 sanderling, all in stunning summer plumage. We were watching sanderling and dunlin last week in Spain so there is still more to come! Exactly the opposite here Ipin, bloody hundreds of sheep chomping away at anything that grows, the place is like a dust bowl ! 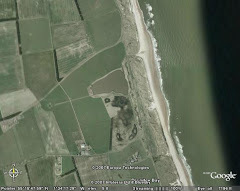 My local patch, Druridge Pools, is a mosaic of different habitas in the middle of the eight mile stretch golden sand that is Druridge Bay (that made it sound quite nice...). It all fits nicely into about 1 square kilometre (NZ2796). The Northumberland Wildife Trust (NWT) bit consists of two wet meadows which should be grazed. They hold water for most of the year, providing wintering habo for wildfowl and waders and in the summer breeding habo for waders, ducks and coot,meadow pipits and skylark are also common. One screen hide looks west and a small hide looks south from the central path. On the north of the central path is a very deep pool, which is sometimes good for wintering duck and otters are regular, the edge can be good for passage waders. The National Trust bit consists of a narrow line of trees seperating the wet bits from the dunes which they also manage. The dunes are best in spring for wildlfowers. To call the line of trees a wood is stretching it a bit, but what the hell. The woods are a bit dense to work for migrants but the north and south ends are good, also worth checking is the Druridge Bushes at the north of the site and the plantation and willows by the entrance. NT also own the two paddocks at either end. Then there is the Beach and Sea. The beach often has large roosts of gulls and terns and away from the summer is good for sanderling and other waders. Seawatching from Druridge can be both rewarding and frustrating, it is often very good but stuff can be a little far out compared to Newbiggin or Snab Point, although I have seen long-tailed skua over my head from the dunes. large numbers of scoter can build up and in most, if not all months, there are red-throated divers about, occasionaly joined by great-northern and the scarcer black-throated. Inland of the pools is farmland and the derelict Chibburn preceptory.